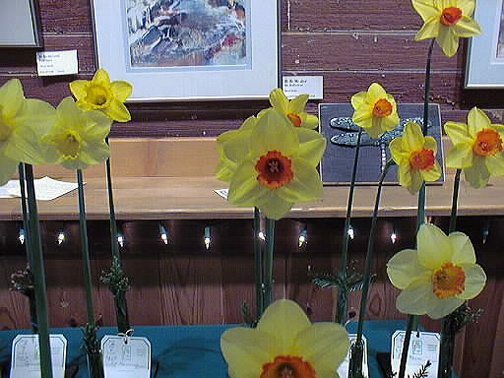 Unfortunately, there are numerous reasons why daffodils might not bloom! 1. Bulbs have not been ‘fed’ in a couple of years. A broadcast of 5-10-10 granules at planting, when leaves emerge, and again at bloom is a reasonable feeding schedule. 2. Feeding has been with a high-nitrogen fertilizer. This encourages production of leaves, but seems to quell the plant’s need for flowers. 3. Bulbs are planted in a shady area. Daffodils need an half-day of sun at least to produce flowers. If planted in partial sun, longer. 4. Bulbs are in competition for food with other plants. Planting under evergreen trees or with other fast-growing plants limits the food they can get. Result: weak plants and no flowers. 5. Bulbs are planted in an area with poor drainage. Daffodils love water but must have good drainage. They do not do well where the water puddles. There, they are weakened by “basal rot” fungus or other evils and die out. Plants infected with basal rot have green color loss on the leaves, malformed leaves, stems, and flowers – or all. Basal rot is incurable – dig and discard the bulbs. 6. Plant leaves were cut too soon or tied off the previous year. Daffodils replenish their bulb for about six weeks after they bloom. The bulbs should be watered for about this long after blooming. The leaves should not be cut off or blocked from sun until they start to lose their green and turn yellow. This signifies the completion of the bulb rebuilding process. 7. Bulbs may be stressed from transplanting. Some varieties seem to skip a year of blooming if dug and replanted in a different environment. Some varieties bought from a grower in one climate may have a difficult period of adjustment to a vastly different climate. They may bloom the first year off the previous year’s bulb, but then be unable to adequately build a flower for the following year. 9. The bulbs may be virused. Many plant viruses attack daffodils. Over time, an infected plant loses its vigor, puts up smaller, weakened leaves and stems, stops blooming, and finally dies. The most common viruses are “yellow stripe” and “mosaic”. Yellow stripe shows as fine streaks of yellow the length of the leaves. It appears as the leaves emerge. The plant is weakened by the second year. Mosaic only appears as white blotches on the yellow flowers where the petals lose their color. Plant vigor seems unaffected. Both these diseases are contagious to other daffodils and incurable. Dig and throw away the bulbs. 10. Growing conditions the previous Spring may have been inhospitable – the reformation of the bulb was affected. An early heat wave may have shut down bulb rebuilding before it was complete. The bulbs may have be grown in a smallish pot without adequate feeding or protection from heat and cold. 11. Bulbs may be diseased or stressed from shipping the Summer before. Retail bulbs typically remain in closed crates for a lengthy period of time during shipping. These humid conditions are near-perfect for the proliferation of fungus diseases such as “basal rot” (fusarium). Some bulbs are infected at the time you receive them. Never buy or plant a “soft” bulb. Cut any observed rotting spots on a solid bulb back to clean tissue and soak the bulb in a systemic fungicide such as Clearys 3336 before planting. Look at the NCDS bulb sources for reputable retailers. 12. Bulbs may have been growing in the same spot for many years and need dividing. Daffodil bulbs normally divide every year or two. This can result in clumps of bulbs that are competing for food and space. Commonly bulbs in compacted clumps cease blooming. Dig the bulbs when the foliage has yellowed. Separate them into individual bulbs and replant them about 6″ apart and about 6″ deep. You may replant immediately after lifting, or you may dry the bulbs in the shade, store them in mesh bags, and replant the bulbs in the Fall. If you replant immediately – do not water them until the Fall. 13. Bulbs may be out to get you! (The case when you give them away in frustration and they bloom wildly for the new recipients).